The perfect tool for removing blackberry canes and hardy vines. Often, made to order. Please allow 1-2 weeks for us to make this tool for you. 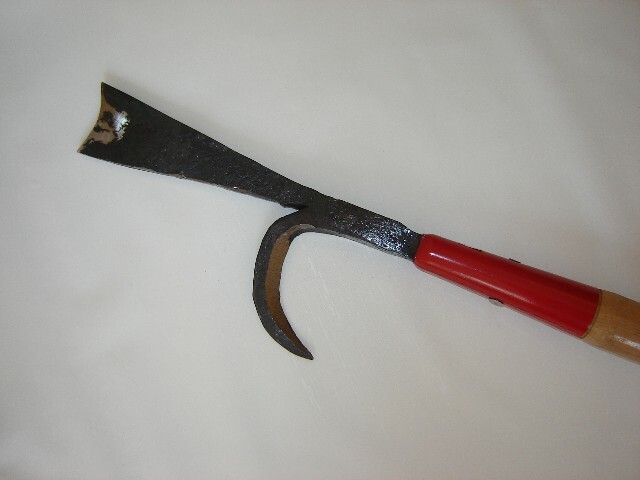 This tool has been around since the Middle Ages when it was used for tree pruning and as a weapon for peasants called to war by their local liege lord. From the 1600's on a version was used for roguing out overgrown berry canes. If you're removing blackberry canes an inch or so in diameter and upwards of 20 feet long, you NEED this tool. The chisel tip is used to cut half way through the base of a freestanding cane. The hook is used to complete the cut and drop the cane AWAY from you instead of ON to you. For canes that are tangled in shrubs or trees, use the chisel to cut through the base of the cane then use the hook to drag the cane from the brush. The long, stout pole keeps you from having a close, personal relationship with thorny stems. Overall length of tool is about 60 inches. I'm working on a patch of blackberries that have had a few years to get thick and tall. I can just throw this hook over the whole mess and rip it down. I can pull blackberry vines out of trees, successfully although somewhat dangerously. I can reach the hook into a blackberry stand and cut the stems at ground level. With enough energy I can rip down a whole patch of blackberries, so I can get at the root crowns and dig them out. For a hand tool that clears blackberries, it's my favorite next to a hedge trimmer and this is most versatile of all.